A transportation book for the youngest ones. 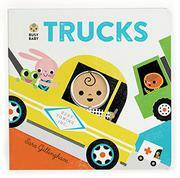 Transportation enthusiasts will enjoy this energetic and playful board book. In bright colors and simple geometric shapes, five vehicles take center stage. A circular die-cut holds a swiveling baby face. Readers can spin the face to a happy or sad expression. “Eee-ooo-eee-ooo!” goes the fire truck as it races down the street. “Uh-oh! There’s a crack in the sidewalk!” The cement mixer can fix that problem. “Woo-wee!” Time to load the recycling truck. “Phew, it’s hot!” Never mind, here’s the ice cream truck. “Clank-clank!” Engine won’t start? The tow truck is here! Babies and their adult readers will find lots of details to look at and discuss in addition to the primary vehicles presented, such as a little ambulance that appears on every spread. Also, babies can decide whether the situation calls for a happy or sad face and spin the face accordingly. A companion volume, Friends, follows a similar format. Here, babies are introduced to relatively abstract concepts such as making friends, sharing, cleaning up, and helping others. The spinning face helps to make these feelings concrete and understandable for children just beginning to grasp these concepts. The text in both books is not scintillating, but it does the job.